In 2010 and again in 2014, the people of Mecklenburg County chose Judge Smith to serve as North Carolina District Court Judge. Since his election in 2010 and re-election in 2014, Judge Smith has presided in Mecklenburg County’s district criminal court, family court, domestic violence civil court, civil court, and child support court. Currently, he is assigned to Mecklenburg County’s family court, where he hears matters involving child custody disputes, claims for child support, alimony requests, and issues concerning the distribution of marital assets and debts upon spousal separation. With judicial redistricting legislation enacted in 2018, Mecklenburg County was divided into eight population-balanced judicial districts within the county. Formerly, voters elected Mecklenburg County District Court Judges in 21 races on a county-wide, at-large basis. Now, the voters of Judge Smith’s Mecklenburg Judicial District 26A will elect three District Court Judges, independent of the rest of the county. Mecklenburg Judicial District 26A is comprised of the following neighborhoods and areas of the county, generally: Mint Hill, Matthews, parts of south Charlotte east of Providence Road, Stonehaven, Olde Providence, Lansdowne, parts of SouthPark, Foxcroft, Myers Park, and Eastover. Prior to his service on the bench, he prosecuted criminal cases for six years on behalf of the State of North Carolina as a Mecklenburg County Assistant District Attorney. As a prosecutor, he prosecuted a wide range of cases involving traffic matters, DWIs, property crimes, armed robberies, drug trafficking crimes, and violent felony assaults ranging to attempted murder. 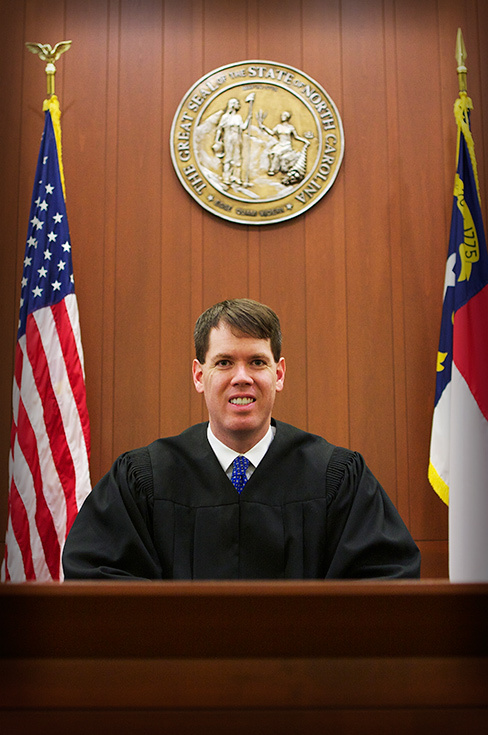 Judge Smith is a Mecklenburg County native, raised in Mint Hill and south Charlotte. He received his undergraduate degree from the University of Notre Dame and his law degree from the Villanova University School of Law. He attends Christ Episcopal Church in Charlotte and is married to Tonya Graser Smith, a domestic attorney at GraserSmith, PLLC. They are the proud parents of two wonderful children, Charlie and Leighton.